Smoke Detector Battery Change Day! Today is the day to change the batteries in your smoke detector. Happy National Change-the-Battery-in-your-Smoke-Detector Day! More commonly known as the day you get to sleep an extra hour thanks to daylight savings time, there is no better way to celebrate this once a year holiday than to get out the step ladder and change the batteries in your smoke detectors. And while you’re at it, take the celebration to a higher level and change the battery in your carbon monoxide detector as well. Daylight savings time marks the beginning of the time of year when space heaters, candles and fireplaces see common use because if it’s going to get dark at 4 p.m., it’s nice to be warm and cozy. Open flames and heating elements are always pointed to as dangerous. But interestingly enough, according to the U.S. Fire Administration nearly 50% of household fires are caused by cooking. Who knew that the creme brûlée in your oven is more likely to start a fire than your creme brûlée scented candle? While you’re changing the battery in your smoke detector, you might find that you wrote the date you installed the the original detector written on it somewhere. If you did that, you are very savvy indeed, because like most pieces of equipment, smoke detectors have life spans. Consumer Reports magazine says the life expectancy of a smoke detector is 10 years. After 10 years, out with the old, in with the new. They also report that pressing the test button tells you only if your battery still has juice in it. The test button does not tell you whether or not the inner bits of the smoke detector that do the important work are functional. The number of smoke detectors your home needs depends on the size and type of home. The National Fire Protection Association spells out the specifics for optimum installation very clearly on their website. 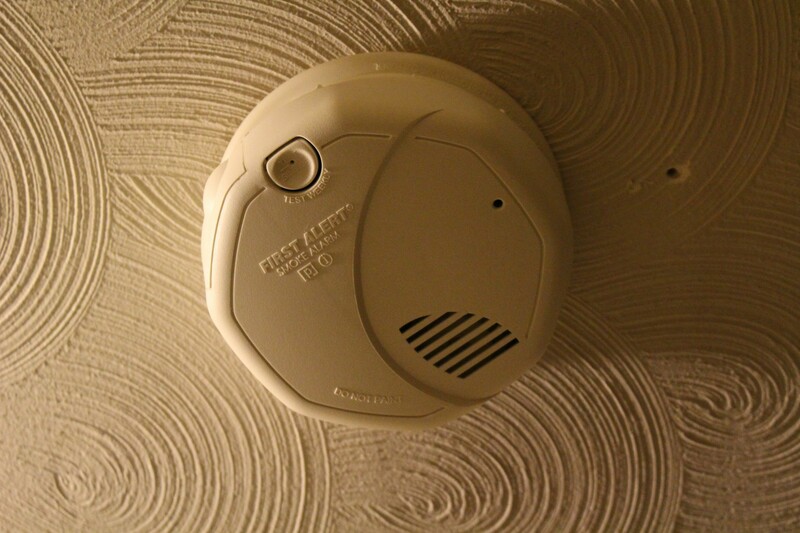 There are different types of smoke detectors: ionization, which detects flaming fires best and photoelectric, which is better at catching smoldering fires. Your house should have a combination of types. For sound sleepers and those who have hearing loss, there are smoke detectors with flashing strobe lights and smoke detector accessories that shake the bed. Today is a great day to show the friends and family who are special to you just how important they are to you by showing up at their house with either replacement batteries or a new smoke detector. It’s one of those tasks that a lot of us think about doing but plan to take care of it…tomorrow…or the next day. Surprising someone by turning up to do it for them is the kind of surprise that puts a spring in their step. It’s the kind of surprise that will take some of the sting out of the realization that it’s going to be dark by 4 pm today (and for the next few months). Today may just be the easiest-peasiest holiday of the year to throw a proper celebration. You don’t need costumes, fancy food, gift wrap or decorations to celebrate National-Change-the-Battery-in-your-Smoke-Detector-Day. All you need is a step ladder, the right batteries and a dollop of let’s do it. We hope you made good use of your bonus hour today, now get out there and celebrate!